On January 24, 2019 at about 7:30 pm, a bus driving on Route 80 in Parsippany collided with the median and then crashed into three cars. This terrible bus accident killed one person and injured at least thirty-six, two critically. The police are investigating the cause of this horrible accident. This headline and the terrible details of this accident seem familiar because we seem to hear about incidents such as this frequently in the local news. In New Jersey, buses are nearly three times more likely to be involved in a large vehicle accident than the national average. This is probably a result of the many commuters who ride buses to New York City, Philadelphia and Newark for work each day, meaning we have more buses on our roads than most others. Under the law, buses that sell seats to the public are called common carriers. This means bus drivers have a responsibility to keep occupants, as well as pedestrians outside of the vehicle, safe. This includes screening and testing drivers as well as making sure its buses are in safe operating order. To put it bluntly, an unsafe bus or a bus operating in an unsafe manner can seriously injure or kill dozens of people in an instant. This is why the owners and operators of buses are required to take such care to minimize these risks. The ubiquitous use of cell phones has only increased the number of distracted drivers. Many people read texts or emails or even write texts or emails while driving. On a highway such as Route 80 where the flow of traffic can be 70 miles per hour or so, a vehicle covers over 100 feet per second. A driver looking at his or her phone for a few seconds can cause a major accident. Whether you tripped and fell while coming onto or exiting a bus or are injured in a bus crash, an experienced attorney will be needed to supply you with the legal representation you need. An attorney’s knowledge of the law and trial skills will help you maximize your financial recovery. Did you or a loved one sustain serious injuries due to a bus accident in New Jersey? Don’t let the medical bills pile up while you wait for the negligent party or their insurance company to do the right thing. Right now, you need an aggressive personal injury attorney on your side, fighting to get you the compensation you need, want, and deserve. 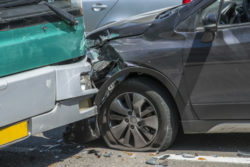 The skilled attorneys at Bramnick, Rodriguez, Grabas, Arnold & Mangan, LLC represents clients injured because of a motor vehicle accident in Newark, East Orange, Irvington, Edison and throughout New Jersey. Call 877-423-4878 or email us to schedule a free consultation about your case. We have an office conveniently located at 1827 East Second Street Scotch Plains, NJ 07076, as well as offices in Newark, Clifton, Elizabeth, Westfield, East Brunswick and Cherry Hill, NJ.